Wasn’t he know for music from the 16-32 bit era? That's what I was thinking, except I remember him from the Saturn/PS1 era as far as music goes. The key difference with console hardware is that they typically are sold for a loss, or at best breakeven or tiny margins. The goal is to sell a crapload of them and hope to make money off software. Google computer gadgets are money makers right off the bat. I highly doubt any of their chromebooks, speakers and such are breakeven..... but maybe I'm wrong. Maybe some of these products lose money and Google hopes to make revenue back on ads. You will be surprised they make a killer off those chromebooks now that they support Google playstore. Google will reveal details about its unannounced gaming project at the Game Developers Conference in San Francisco next month, according to an invitation sent by the tech giant Tuesday. The company will hold a keynote presentation on March 19, at 10 a.m. PT, where it’s expected to reveal details about a new endeavor focused on video games. Official details are scant. Google’s invite only included the tagline “Gather around” and an image of what appeared to be a darkened hallway leading toward a lighted exit. Spawn Wave put up a video about the Google rumors. I'll update this post with anything interesting. 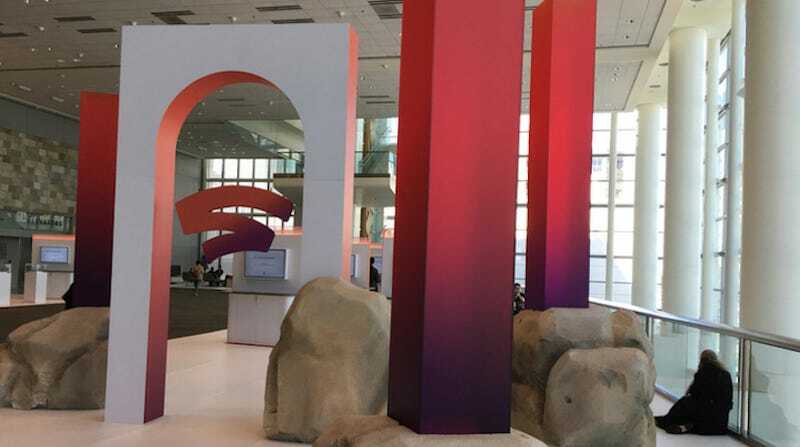 Later this month, Google is hosting a mysterious event during the Game Developers Conference that very well could revolve around its the rumored streaming service, which in past reports has been likened to a “Netflix for games” and is said to be built on the technology Google developed for its Project Streamtrial last year. I tried out Google's project stream with Assassin's Odyssey (got a free copy of the game too). It'll be be interesting to see what they do in the gaming space. I’m surprised they have yet to purchase any devs, yet. Amazon has already gone out and bought a few, and never have their own version of the crysis engine. Even if they bring out a console with a decent CPU, it can easily be superior to X and Pro from the start. The only obstacle then is beating a 6TF of GPU. That isn't that much anymore, so they can go fairly cheap on the GPU side and beat out Sony/MS then release an even more powerful version later. Who knows, they might not even go for a powerful system though. I got a feeling their more interested in a streaming service for gaming, with their own internal studio built from the ground-up, or studios commissioned to make exclusive games. Didn’t MS try that before, with the latter, have a studio who’d have other studios make games based upon/around their own or other, kinda like 343 wih MCC and to an extent their anime compilation....but I get ya. ID software, Ubisoft, Crystal Dynmanics, Amy Henning are a few also confirmed to be there. I wouldn't be surprised if they show off the new Doom game running on it to showcase how minimal the input lag is. I haven't kept up with MS' practices in a while, but many do that. Where instead of owning the studio, they commission the studio for an exclusive release, usually with the rhubarb being that they own the IP or have to wait a while before releasing on another platform. I can see Google doing that for a short while, to get some spotlight. So... supposedly the effective power will be over 10TF. I still don't know. Wouldn't that be dictated by how many people are playing at a given time? So none of the background footage they've shown looks that great. I'm waaaay on the fence here. Lots of neat Ideas, but how long before they come to fruition, and how will it go in real world conditions?